Pause. Think about it. How long have you been sitting at your desk? 10 minutes? Three hours? Did you eat healthy today or make a run to the vending machine? When was the last time you took a break? If you are like many well-meaning entrepreneurs, you push yourself to the max working as hard as you can for as long as you can. You know your time is precious and finite after all. You wind up though, not taking care of yourself as you should and your work suffers. You can’t possibly keep burning more steam without adding coal to your fire. You need to power up your body. Taking breaks is a necessary part of refueling your system and doing so causes increased productivity – exactly what you need to accomplish more and maximize your success. Measure your productivity by how long you’ve been sitting at your desk. Feel like you never have time to take breaks. Find yourself eating at your desk more often than not. Lose focus and energy toward the end of your workday. Often take twice as long as you should to complete tasks. If any of these statements hold true for you, chances are the culprit is your diminished energy level because you don’t take breaks to refuel yourself. How Do Breaks Cause Increased Productivity? Taking breaks enables you to focus and maintain a higher level of concentration, which in turn creates efficiency and productivity. When your energy is low it is typically because you have not been giving yourself sufficient breaks to carry on. Not taking breaks lowers your willpower and tends to make everything else seem more exciting than what you are working on at present. 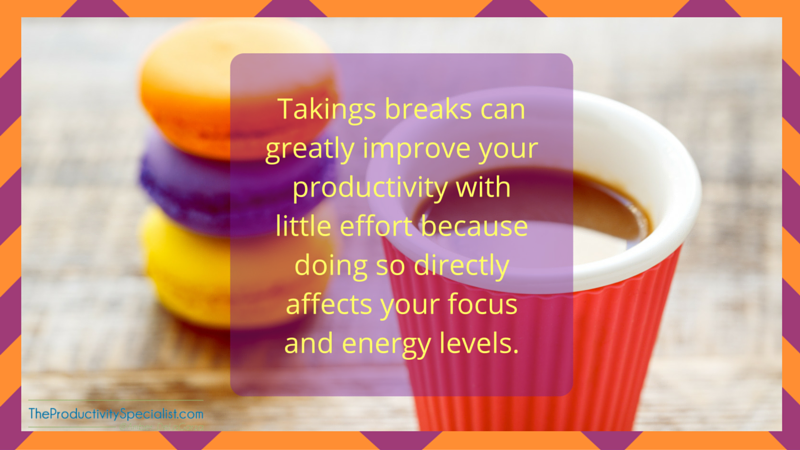 Not taking breaks also makes it easy to fall prey to distractions. You may not be aware you need an actual break, but you know you can no longer focus on the task at hand. That is when the temptation to take phone calls, read text messages, or check your email constantly is strongest. You want to feel like you are still making progress despite your lack of will power and energy level so you find other activities to occupy your time. Taking a break helps refuel your body and provide much needed energy. Breaks involving eating a healthy snack, drinking water, stretching, or getting a little exercise will create additional energy your body physically desires. More energy means you will have the endurance to work more focused and efficiently throughout your day. Takings breaks goes a long way toward increased productivity with little effort because doing so directly affects your energy levels. Despite your motivation to keep going, when you refrain from taking breaks, you lose steam and eventually the willpower to continue. When that happens, a task that should have only taken 15 minutes could take you 30 minutes or longer. Work more efficiently by giving yourself breaks as necessary to regain the focus and energy needed to complete tasks in less time. Taking a break does not have to be sitting at your desk twiddling your thumbs until it’s time to work again. Consider a break to be engaging in anything that refuels, relaxes, or re-energizes you, and enables increased focus afterward. Get Fit – Yoga or a group pilates class can do wonders for stress relief. Read – Reading during your break is a great way to find more time to read. Listen To Music – Listening to your favorite jams never fails to provide an instant energy boost. Chat With Friends – Communication and interaction with others causes a spike in energy for many people. Take A Nap – Honestly, sometimes you just need a quick catnap. Whether you’re at your desk or in your parked car, close your eyes and let them rest for a few minutes when you feel the strong need to do so. Statistics have shown that your cognitive function increases with just as little as a refreshing 5 to 15-minute nap. Taking breaks does not make you lazy. Taking breaks does not mean you think your work is boring. When you decide to take a purposeful break, you are making the choice to refuel and re-energize so you can return to your work refreshed and with a renewed sense of focus. Stop denying yourself breaks. A few minutes away from your work could add up to hours in increased productivity.